Hacking gallery. Spyscape, New York. This exciting new museum and visitor experience opened in New York in 2018, with plans to roll out to other cities and in other media over the next few years. The project burrows into the world of spying to explore secrecy and privacy in the modern world. 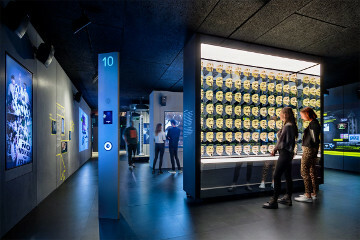 Stories are told through stunning motion graphics and unique artefacts, while a series of interactive challenges enable visitors can assess their own spy skill set. This amazing project was designed by Adjaye Associates and brought together a strong internal exhibit and motion graphics team led by Ross Phillips. The subject scope is broad – from World War II through the Cold War to contemporary journalism, hacking and corporate data gathering and mass surveillance. Running through this eclectic mix is our fascination with power relationships based on secrecy. Stephen worked with Casson Mann and Onedotzero on the early stages of the project, defining stories and an overall narrative. Later he provided visitor experience consultancy, developed briefs and edited the final text. During the course of the project, Stephen explored the fascinating psychology and ingenious technology of spying, working with subject experts including former spies, hackers and police officers.